In 1971, Ray Tomlinson sent the world’s first email, a message passed from one computer to another placed directly beside it. 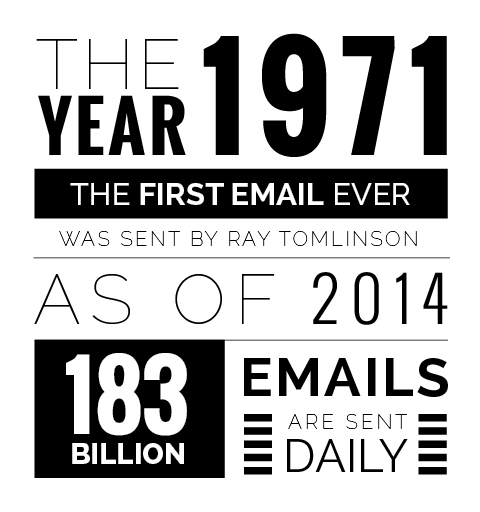 Now, just 43 years later, we send approximately 182.9 billion email messages each and every day. Email is just one example of the kind of explosive growth experienced by the Internet and its features. Since its development in the late 20th century, the Internet has quickly evolved into a necessity for our daily lives; less than 20 years ago, Internet access was considered a luxury, and it certainly wasn’t fast, either. In our graphical representation of the Internet, we explore a series of famous Internet firsts you may not have known about, including the first spam email, the first item purchased online, and some of the first social media updates. We’ll also show you where these famous firsts are today, and how they’ve grown over the years. Some of the statistics may surprise you! Since email’s humble beginnings, the technology has grown into something we now find it hard to live without. As of 2014, approximately 183 billion emails are sent daily. Additionally, the number of worldwide email accounts is expected to reach 4.9 billion by the end of 2017. 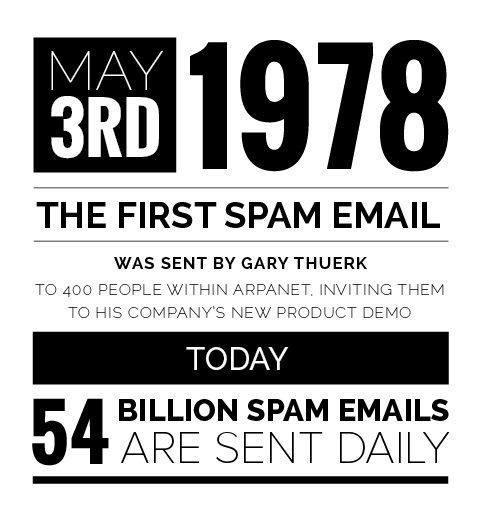 Gary Thuerk, the “father of spam,” sent out the first unsolicited email to an audience of about 400 on ARPANET in 1978. The message was meant to promote DEC’s new product demo on the west cost. As ARPANET was, at the time, a channel with limited usability and serious restrictions, this resulted in some backlash. You can read a copy of the email, and some of the replies sent, on this page. According to an April 2014 report by Cyberoam, the average daily spam level around the world is approximately 54 billion emails per day. Some days are actually higher! 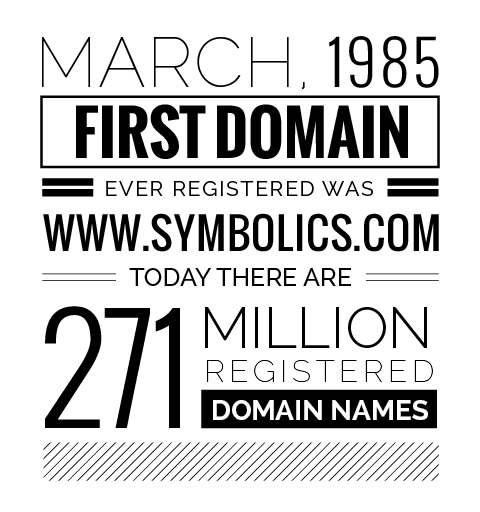 The first domain name ever registered was symbolics.com in March of 1985. It was purchased by the Symbolics Computer Corporation, a computer development company. They retained the domain in 2009, until it was sold to a Texas-based investment group, who continues to preserve its legacy online. You can still visit symbolics.com and read about its history here. As of April 2014, Verisign reports a total of 271 million registered domain names. 7.3% more URLs were registered in 2013 than in 2012, and .com remains the most popular TLD (top-level domain). The very first website on the Internet, which you can still visit today, was created by Tim Berners-Lee on August 6, 1991. The website provides information on the “World Wide Web,” Berners-Lee’s invention — essentially, the visual version of the Internet we use today, which consists of documents joined together by links, made visible through the use of a web browser. Berners-Lee also invented the first web browser, similarly titled “WorldWideWeb”; the browser was released in December of 1990, and was able to both view and edit webpages. 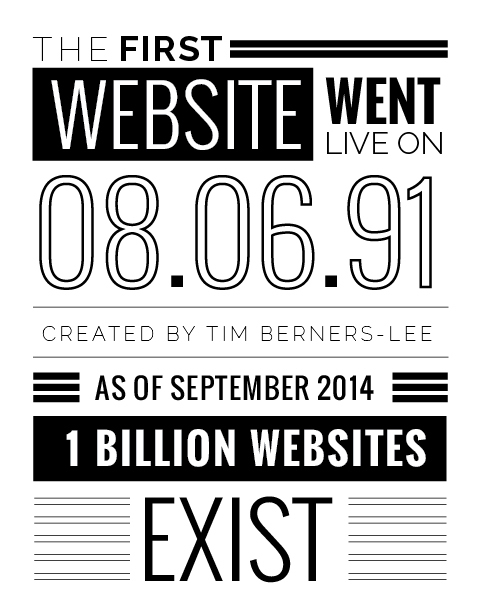 Though it’s difficult to accurately count the number of total websites on the Internet, internetlivestats.com puts the number at over 1 billion (as of last month). 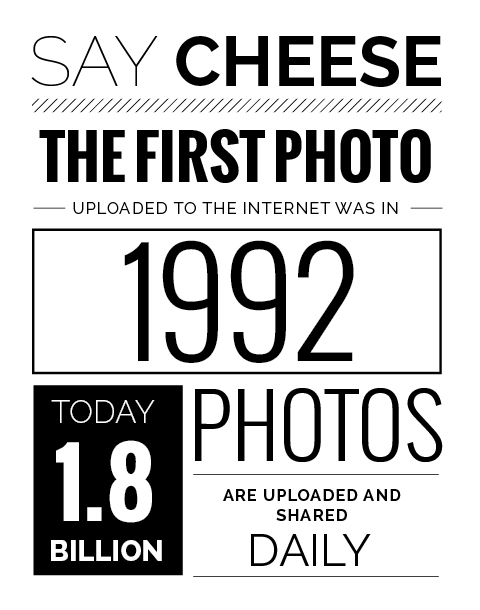 Tim Berners-Lee, creator of the World Wide Web, uploaded the first photo to the Internet in 1992. 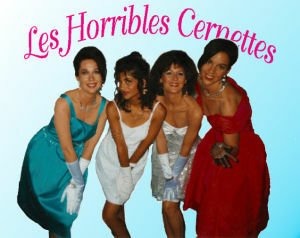 The photo was of a comedic musical act titled Les Horribles Cernettes, made up of four female CERN (European Organization for Nuclear Research) employees. Berners-Lee reportedly asked one of the members for a few photos of the group after one of their performances in 1992, but she had no idea what he was going to do with them, or what significance they would eventually play in the story of the origin of the Internet. Currently, approximately 1.8 billion photos are uploaded and shared online each day, among platforms like Facebook, SnapChat, WhatsApp, Flickr, and so on. In 1990, the McGill University School of Computer Science launched Archie, a tool that allowed people to find specific files on FTP archives connected to the Internet. Because Archie allowed its users to search for specific items on the Internet, and eventually acquired a user-friendly interface on the new World Wide Web, it is considered the first search engine. 24 years later, Google has become the most popular search engine, with more than 45,000 searches occurring each second. As a byproduct of search engines, a new and ever-growing industry was born – known as Search Engine Optimization or SEO for short – and has evolved into a necessary practice for websites. Joe McCambley, then a creative director for an interactive agency named Modem Media, pitched the idea of a banner ad — then a brand new concept — to one of the agency’s clients, AT&T. The agency and AT&T worked together to create an ad that was hosted on Hotwired.com. Instead of promoting AT&T, the ad urged viewers to click on the banner (using the clever call to action “you will”) to see a total of seven museums containing great works of art from around the world. 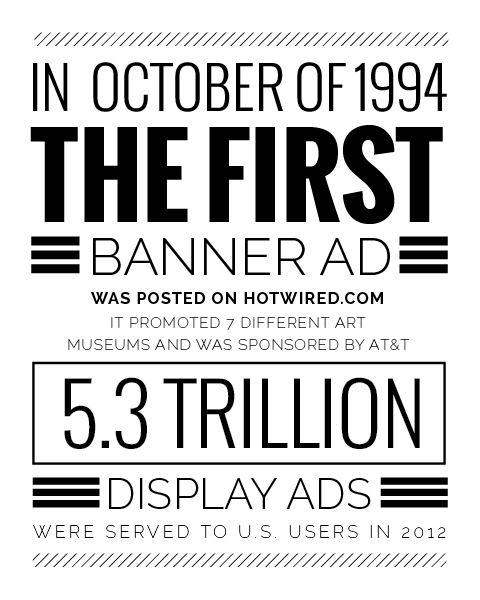 According to Modem Media founder GM O’Connell, the first banner ad had a 44% clickthrough rate. Although the ad didn’t reach that many people — the Internet was still in its infancy in 1994 — it received a lot of press attention, and helped AT&T secure its position as an industry innovator. A 2012 report by comScore showed that over 5.3 trillion display ads were served to Internet users in the United States in 2012. But the clickthrough rates for these ads were probably much lower than that first one! 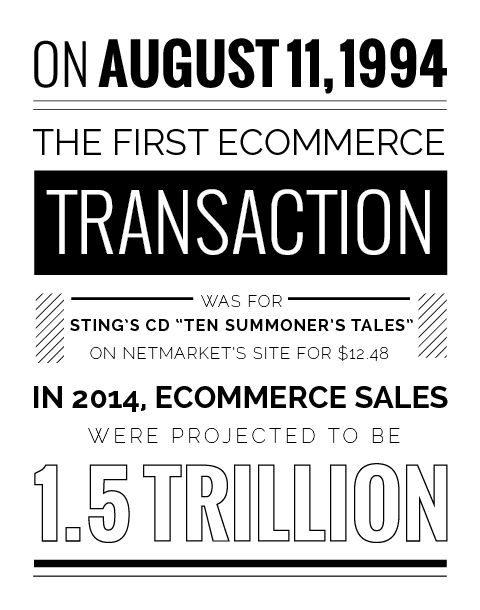 20 years ago, in August of 1994, the first secure ecommerce transaction took place. The first item sold online is highly debated, but most agree that NetMarket’s sale of Sting’s Ten Summoner’s Tales for $12.48 was the first secure online purchase. The purchase was by no means smooth and efficient — in 1994, shoppers had to use special programs to transmit billing information over the Internet in a secure fashion, or switch to another browser entirely — but it led to the advancement of ecommerce, which was a billion dollar industry just four years later. In 2013, more than $1.2 trillion was spent online. Initial ecommerce projections for 2014 were in the neighborhood of $1.5 trillion. Founded in Jeff Bezos’ garage in Washington in 1994, Amazon.com sold its first item — a book — on April 3, 1995. The book was Douglas R. Hofstadter’s “Fluid Concepts And Creative Analogies: Computer Models of the Fundamental Mechanisms of Thought.” The book is still for sale on Amazon.com and has a 4.5 star rating. 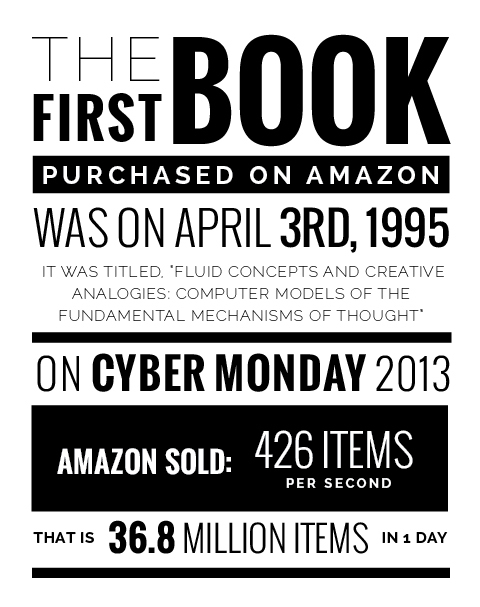 In 2013, Amazon set a sales record, selling more than 36 million items in one day on Cyber Monday. This came out to approximately 426 items sold per second. Not bad for a company originally started in a garage selling a few books! 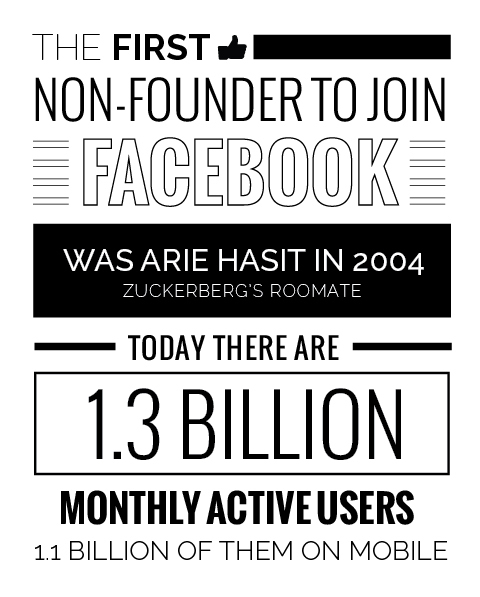 The first few accounts created on Facebook were reserved for testing, Mark Zuckerberg, and his co-founders. But the first real user to join the site was Arie Hasit, Zuckerburg’s roommate at Harvard, who joined the site in early 2004. Hasit, whose account ID is 7, currently lives in Israel and works as a rabbi. According to Facebook, there are currently 1.3 billion monthly active users, a large majority of which are on mobile devices. 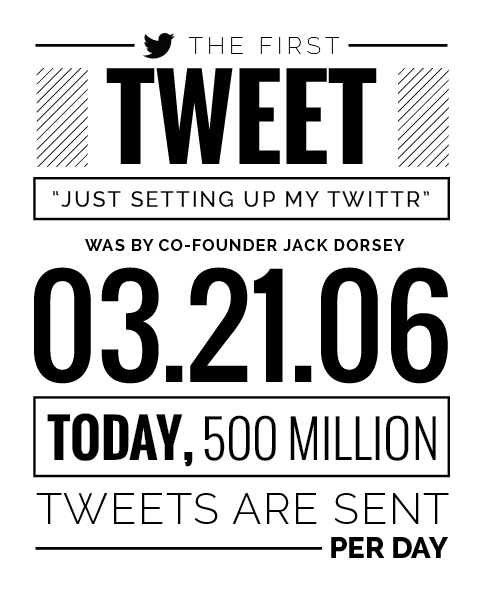 Twitter co-founder Jack Dorsey made the first tweet on March 21, 2006, when the site was still known as twttr. According to Twitter, 500 million tweets are now sent each day, only eight years after the social media network’s original inception. 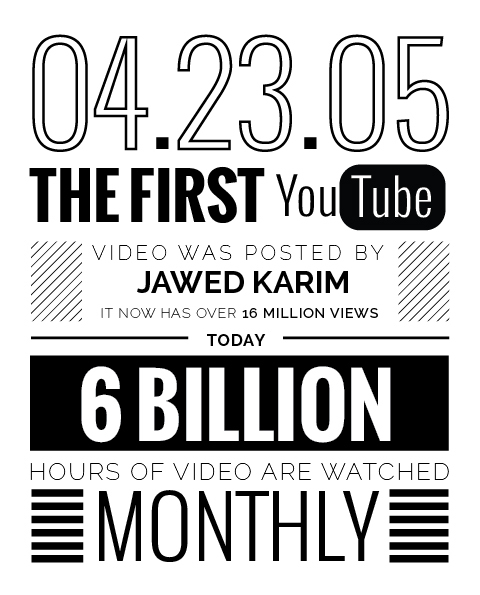 YouTube co-founder Jawed Karim uploaded the first video to the site at 8:27 PM on Saturday, April 23, 2005. The video was a 19 second clip of Karim at the San Diego Zoo talking about elephants. Today, 6 billion hours of video are watched each month on YouTube — about an hour for every single person in the world. 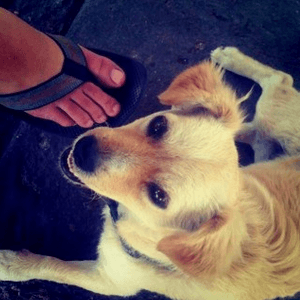 Instagram co-founder Kevin Systrom posted the first photo on Instagram on July 16, 2010, a few months before the app’s initial launch on iOS in October. The photo was of a golden retriever, reportedly at a taco stand. 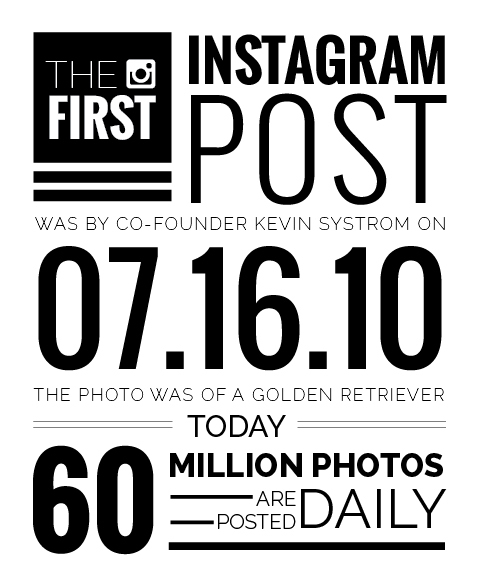 Instagram now reports that 60 million photos are shared per day. 200 million users are active on the app and website each month, and a total of more than 20 billion photos have been shared since the app’s inception in 2010 — just four years ago. That’s a lot of photos! These are just a few of the famous firsts on the Internet. From the first website to the first photo to the first tweet, these services and now-common functions have certainly come a long way since these remarkable milestones, and we’ve tracked them all in our graphical representation of the Internet. But while it’s entertaining to look back and think about how much has changed in the past 25 years, just imagine how different things will be in another decade or two! Which of these famous Internet firsts is your favorite? Do you have another online milestone or fact you’d like to share? Feel free to leave a comment and let us know!